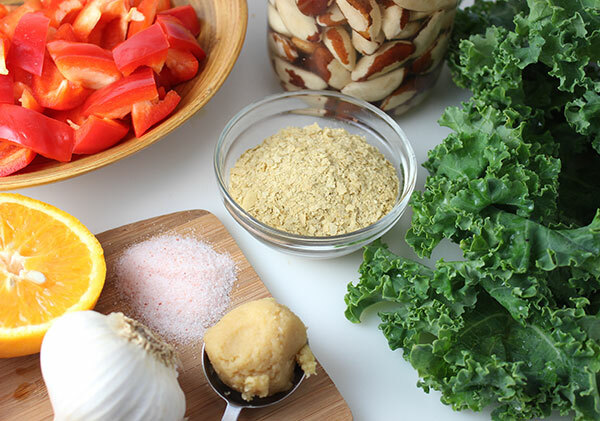 This is our cheesy kale chips recipe blending both the nutrition of kale together with vegan nut cheese to create a healthier alternative to the standard potato chip. 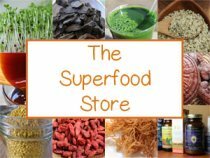 Kale chips are a recent invention which first came about in the mid to late 2,000's and were originally sold commercially by the raw food inspired company Alive and Radiant Foods. We have personally been making kale chips in large quantities since 2008, keeping them well stocked in our pantry for when we crave a crunchy savory snack. Today there are literally over 50 different companies in the U.S. making this very popular chip variety, now sold also in more mainstream supermarkets as well as health food stores. 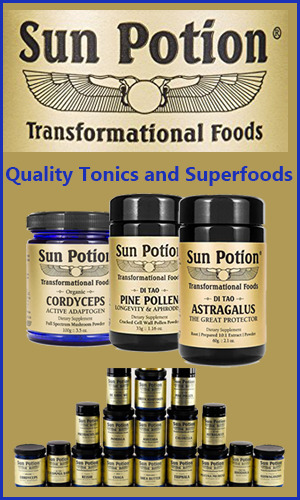 If you have to buy your own kale chips, out of convenience, Alive and Radiant Foods is still our top favorite brand who have the best selections and are the highest quality available in our opinion. After purchasing many bags of kale chips when they first arrived on the shelves in local California markets, we eventually decided to try to make our own from scratch. What we immediately realized is that you get WAY more chips for the same cost you would usually spend on a small 2oz portion, even using completely organic ingredients. Not only that, homemade crispy kale is fresh and has less of a tendency to break apart and crumble like many of the packaged store-bought products. The only down-side to making your own kale chips recipe is that you could develop quite an addiction if your not disciplined enough to resist the temptation. Although kale chips are relatively healthy, you can over-consume nuts and seeds. When eaten in large amounts, they can be mucus-forming and cause digestive imbalance. They do contain sea salt as well, which is best not to eat in huge servings. If you've never had a cheesy kale chip before, they have a light crunch and delicious cheesy nut flavor. 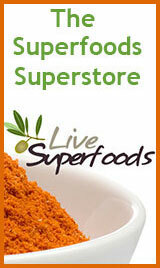 When consumed in moderate amounts, they provide a good amount of nutrients. They are by far a MUCH healthier option compared to processed, fried potato or corn chip selections, which are full of refined vegetable oils and transfats. These chips are made out of the highly nutritious green leafy vegetable called curly kale. All kale varieties are chlorophyll-rich alkalizing green leafy vegetables that are great to balance with other more acidic foods. Kale, in particular, is high in some vitamins and minerals including calcium, beta-carotene, vitamin C, vitamin K as well as other carotenoids like zeaxanthin and lutein. 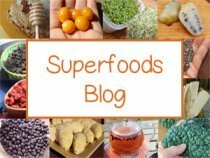 Kale also contains the sulforaphane, an anti-cancer nutrient also found in broccoli sprouts and other cruciferous vegetables. There are many ways to get more greens into our daily diet without having to sacrifice taste for nutrition. Kale chips are one way to do this, especially when prepared at a low temperature setting at about 118° F (48°C). They will loose mostly water and of course some nutritional value, but will also retain many of the health enhancing compounds that kale is known for. We also recommend kale salad, green juices and green smoothies for other ways to introduce fresh kale into one's daily meal plan. In one study analyzing the benefits of cooked kale vs. raw kale, it was concluded that "the cooking process of kale resulted in lowering of the antioxidant activity of its antioxidants especially of vitamin C, polyphenols and to the lesser extent of ß-carotene." 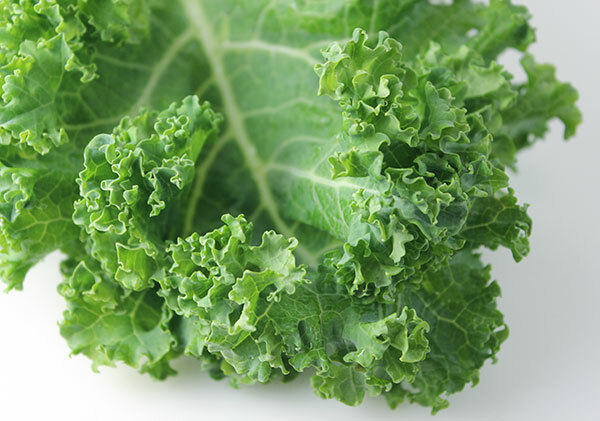 Cleaning Kale - It is beneficial to rinse kale thoroughly with pure water and spin dry. 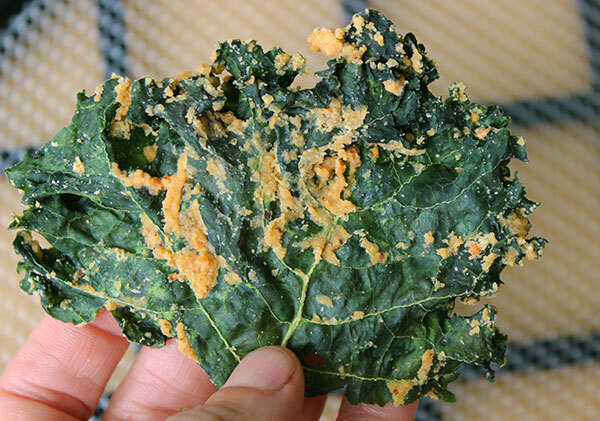 This will remove any possible dirt particles that may make their way into the ruffled curly kale edges. It is also best to make sure the kale is not soggy and free of water droplets before adding your cheese. De-stem the Kale Leaves - The kale provides a better texture if most of the fibrous center stems or stalks are removed. To do this you can simply fold your kale leaf in half (lengthwise) and slice off the stem from top to bottom with a knife. Using Curly Kale - The best kale to use, in our opinion, is the curly kale variety. It has the most perfect texture and ruffled leaf edges for holding the cheese as well as creating a crispy quality when dried. Flat kale types can also work but should be a second choice over the leafier varieties. Keep Kale in Big Pieces - From our experience, it is best to keep the kale pieces as large as possible rather than breaking them down into smaller leaves. 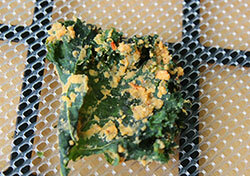 Kale dries up considerably after dehydrating and this will leave you with very small pieces, which can crumble easily. After the dehydration time, the bigger pieces of kale can be further broken apart to make chip-sized pieces. Cheesiness Control - This cheesy kale chips recipe can be made using more or less kale depending on your personal taste preferences. Some people like them super cheesy while other prefer them only slightly cheesy with more green kale leaf ingredient. In our recipe you can use either 2 big bunches for the "big cheese" flavor OR 3 big bunches of curly kale to offset the richness of the nut mix combination as well as reduce salt content. Massaging the Kale - This process is best done by hand. On a counter-top space, line up (from left to right) your bowl of clean de-stemmed kale, an empty bowl in the middle for massaging your kale, the blender of cheese sauce and a row of dehydrator sheets ready for laying cheesy kale pieces. 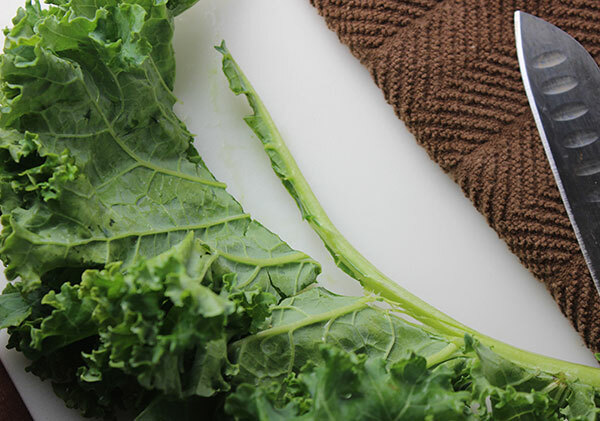 With clean hands (or kitchen gloves) take a big piece of kale and hold it over the empty bowl. Take a scoop of cheese sauce and gently massage it onto the kale. 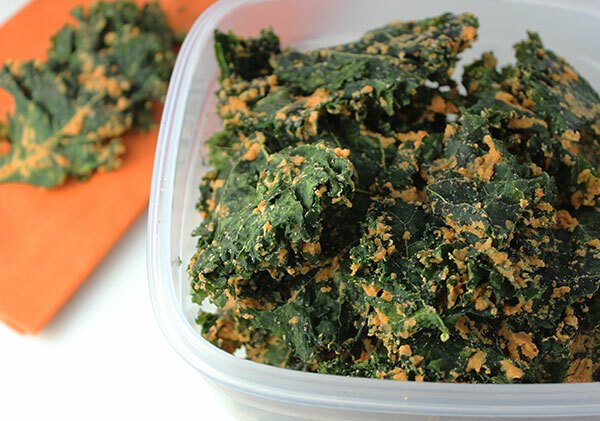 Place the freshly cheesed kale pieces onto your dehydrator sheets. 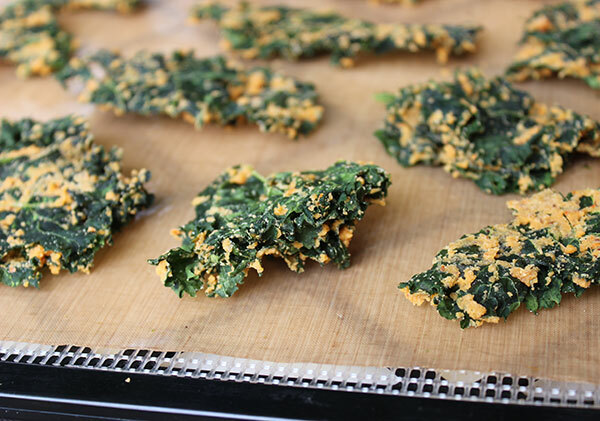 Use Non-stick Dehydrator Sheets - When preparing the cheesy kale pieces for dehydrating, it is a lot easier to use non-stick sheets rather than screens. Although the kale will dry faster with screens, the cheese will fall through and clog of the holes which will create more clean-up work later. We use the screens underneath the non-stick sheets for support, but only use the sheets for the entire dehydration period. Kale Chip Storage - Kale chips are best stored in wide open air-tight containers that have lots of space. 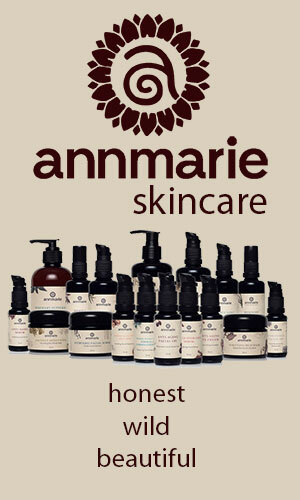 This will prevent them from being smashed which is sometime the case when crammed into bags or narrow jars. 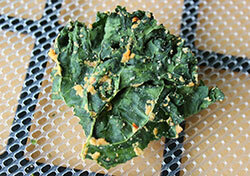 To make this kale chips recipe you will need a dehydrator, preferable a 5-9 tray Excalibur model. There is, however, another old-school alternative to using a dehydrator. This is using an oven on a very low setting and leaving the door cracked open slightly. We do not recommend baking kale chips as this will deplete nutritional value, destroying phytonutrients and enzyme content. Wash, dry and de-stem kale leaves, keeping them in bigger size pieces. Set aside in a large bowl. In a high speed blender make your nut cheese by blending the strained soaked nuts and all other ingredients until completely smooth. It is best to place the orange juice and red bell in first as it will tend to blend easier. Set up work station as instructed in the kale chips recipe tips section above. 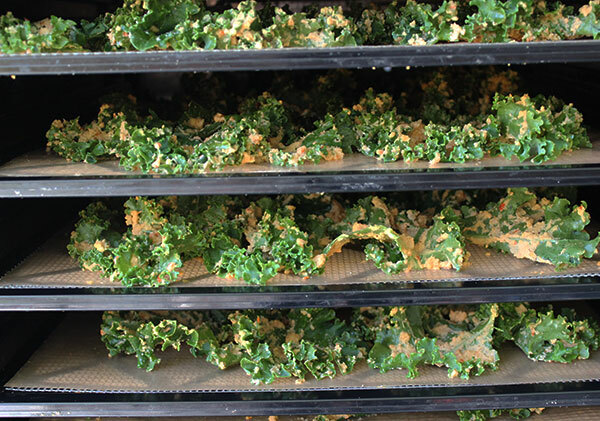 Massage the kale leaves with the cheese mixture and lay them out on dehydrator trays with non-stick sheets. Place trays into a dehydrator on medium setting or at 118° F (48°C) to preserve greater nutrient content. After about 5 hours you can (but it is not completely necessary) take a metal spatula and gently loosen the kale from the sheet, this will help it to dehydrate faster. Dehydrate for 7-8 hours or until crispy. 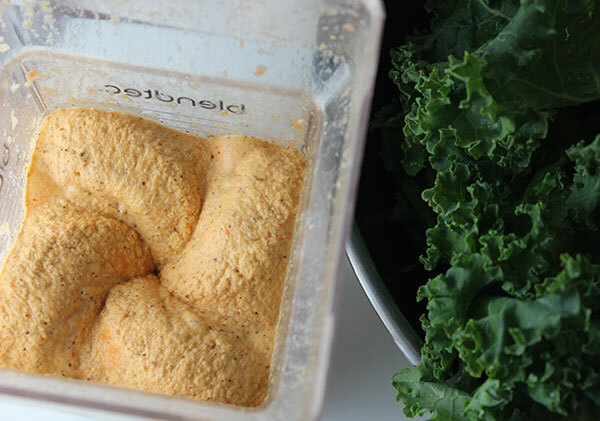 Store your kale chips recipe in an air-tight container. They will last many weeks, potentially months if kept sealed in a cool, dark location. 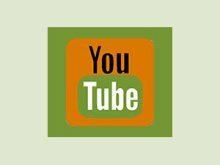 For more raw vegan recipes or other chips and crackers, check out our sprouted rye crackers, squash chips, coconut bacon bits and homemade cheez its in the links below.